The empire that was Aryavarta fades under the shadow of doom. 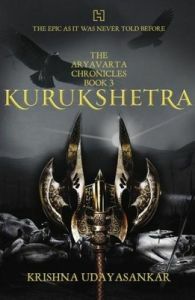 As the bitter struggle to gain control of the divided kingdom ensues, Krishna Dwaipayana Vyasa of the Firstborn and the Secret Keeper of the Firewrights can only watch as their own blood, their kin, savage and kill on the fields of Kurukshetra. Restraint and reason have deserted the rulers who once protected the land and they manipulate, scheme and kill with abandon - for victory is all that matters. At the heart of the storm stands Govinda Shauri, driven by fickle allies and failed kings, to the very brink of darkness. He may well be the greatest danger Aryavarta has faced yet, for he is determined to change things forever. Reforging the forsaken realm in the fire of his apocalyptic wrath, he prepares to destroy everything he loves and make the ultimate sacrifice of them all for the sake of one last hope: that humanity will rise, that there will be revolution. In the spectacular, entrancing final episode of The Aryavarta Chronicles , Krishna Udayasankar's recreation of the world of the Mahabharata establishes her as a storyteller of formidable power and imagination. Krishna Udayasankar is a graduate of the National Law School of India University (NLSIU), Bangalore, and holds a PhD in Strategic Management from the Nanyang Business School, Singapore, where she presently works as a lecturer. Govinda, Krishna's bestselling debut novel and the first in the Aryavarta Chronicles series of mytho-historical novels, received critical acclaim. She is also the author of Objects of Affection, a full-length collection of poetry (Math Paper Press, 2013) and is an editor of Body Boundaries: The Etiquette Anthology of Women's Writing (The Literary Centre, Forthcoming, 2013). When she is not watching Rajinikanth movies first-day, first-show, complete with applause and whistles, or hanging out with her fictional characters, Krishna can be found with her family, which includes two book-loving Siberian Huskies, Boozo and Zana.